Trade unlimited stocks and options commission-free for just $99/month! Open and fund a Tradier brokerage account. Register a free Quantcha Evaluation account using the same email address as your Tradier account. You don't need to sign up for a paid subscription here because your Tradier brokerage account will be billed directly. 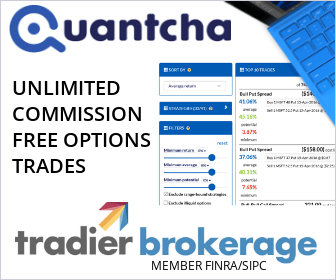 Once you've funded your Tradier brokerage account, link your Quantcha and Tradier accounts. You can then trade stocks and options commission-free. Tradier passes along all exchange and regulatory fees. Full details on Tradier pricing is available here.